In his 100th game, Nathan Fyfe has amassed a careerhigh 37 disposals. He has also won a season best 11 clearances and won at least 20 contested possessions in a game for the third time this season. After being prolific scorers from intercepts generated in the forward half for the first three quarters, the Dockers have scored all of their 3.1.19 from possession gains launched from their defensive half this quarter. 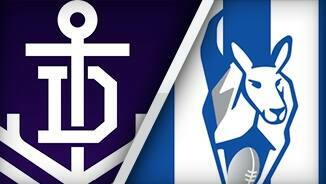 Fremantle has now outscored North Melbourne 11.8.74 to 3.3.21 from turnovers. After being comprehensively beaten in this area in the first three quarters, North Melbourne lead contested possession 20 to 14 in the final quarter. North Melbourne has won the centre bounce clearances 13 to six, but have scored just 0.2.2 from this score source. Prior to tonight, the Kangaroos were ranked second for scores from centre bounce stoppages, averaging 15 points per game from this source. Fremantle InterchangeTommy Sheridan was substituted into the game for Matthew Pavlich. The Dockers lead the contested possession count 11089 at three-quarter time. Nathan Fyfe has again been outstanding with 17 contested possessions, eight more than the next highest on ground. Fremantle has outscored North Melbourne 9.7.61 to 3.2.20 from turnovers. North Melbourne are kicking at an efficiency of 82 per cent for the quarter and after kicking at just 55 per cent in the first quarter, it has gone at 76 per cent since quarter time. The Dockers continue to score from chains launched in their forward half, with 9.8.62 coming from forward half chains7.5.47 coming from possession gains and 2.3.15 coming from stoppages. North Melbourne InterchangeTrent Dumont was substituted into the game for Luke McDonald. Welcome to Domain Stadium for the Fremantle v North Melbourne Round 8 clash. NAT FYFE celebrated his 100th match with a career-high 37 disposals to help Fremantle destroy North Melbourne by 73 points and remain undefeated, two games clear at the top of the AFL ladder. 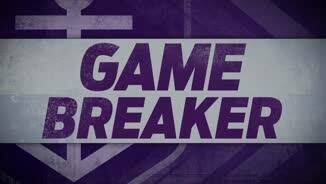 Michael Walters also bagged four goals as the Dockers won their eighth straight game of the season, 17.13 (115) to 5.12 (42), in front of 35,836 fans at Domain Stadium. Fyfe surpassed his previous best of 36 disposals, which he registered in round two this year against Geelong. Lachie Neale collected 34 and kicked a goal. Michael Barlow gathered 30 and kicked two, while David Mundy had 27 touches and also kicked two goals. Walters, Hayden Ballantyne and Chris Mayne were incredible with their defensive pressure up forward, forcing turnovers and kicking seven goals between them. The defence was impenetrable once again, with Garrick Ibbotson taking intercept marks at will. 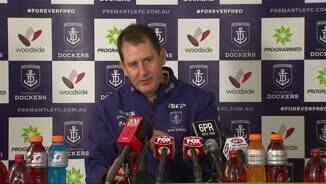 "It was a strong performance," Fremantle coach Ross Lyon said post-match. "We're hungry, we're working hard. A few things we came to improve upon, our forward 50 stoppages and bits and pieces, I thought we did that." The Kangaroos had few winners on the night. Ben Cunnington fought hard in the middle with 24 touches and eight clearances. Todd Goldstein was good in the ruck against Aaron Sandilands with 31 hit-outs, while Scott Thompson was outstanding in keeping Matthew Pavlich to just one goal while the rest of the defence was under siege. 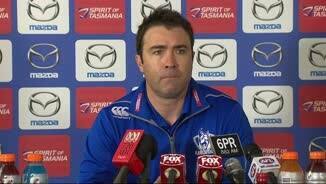 Kangaroos coach Brad Scott said Fremantle was a cut above his side. 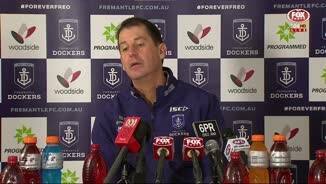 "I thought Fremantle was exceptional tonight," Scott said post-match. "They are an outstanding side. "I thought we were monstered in the contest at times, not across the board, but certainly a few of our guys. "We just got killed in terms of errors. 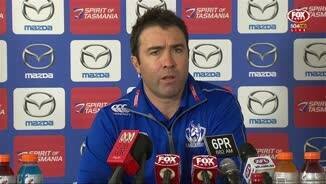 "I think we conceded 13 goals from turnovers - and really bad ones. Really soft goals, and good sides don't do that." The Dockers kicked their second highest score of the season while restricting the Kangaroos to the lowest score of any opponent they have faced in the first eight rounds. Fremantle's win followed the blueprint that has been laid out so many times already this season. The Dockers bolted out of the blocks, kicking three goals in the first six minutes of the match to leave the Kangaroos shell-shocked. Walters kicked two of the three, the first from a set shot after pinning Ben Jacobs with a ferocious tackle inside 50 in the opening seconds. The second was a silky finish on the run from a tight angle after Fyfe stormed through a stoppage to gather and dish off a handball. 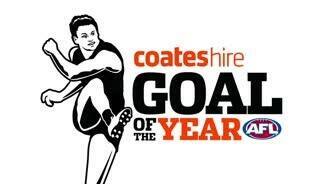 The Kangaroos only goal for the term came from a bad skill error from Michael Johnson in the back half. He hit opponent Jamie Macmillan on the chest and watched the ball sail back over his head for a goal. The Dockers' lead was 26 at quarter-time, but there was plenty of niggle between the sides. Goldstein collided with Ballantyne off the ball to give away a free kick in the first quarter. Sandilands squared up with Goldstein in response. Thompson and Pavlich needled each other throughout the first. The opening two goals of the second term came from holding free kicks. It was an arm wrestle for most of the term, but when Fyfe was penalised for a push that gifted Jack Ziebell a goal to cut the margin to 21, the Dockers' star stepped it up a gear. He won the next two centre clearances and both resulted in scores. The first was a rushed behind but Lachie Neale goaled after the Dockers turned over the kick-in. Fyfe's next clearance went long to the square with Pavlich bringing the ball to ground for Ballantyne to soccer through his first. Fyfe had 20 possessions, 11 contested, and seven clearances to half-time. The lead was 34 points at the long break, but the Kangaroos were fortunate that Matt Taberner hit the post after the siren, having been gifted a free kick through some ill-discipline from Lindsay Thomas. The Dockers skipped clear in the third term. Their insufferable forward half pressure created goals for both Taberner and Walters, while Mayne kicked his second after a brilliant coast-to-coast move around the outer side from a kick-in. The lead was 53 at three-quarter time and it was blown out in the last as the Kangaroos kicked six behinds for the quarter. They head back to Melbourne 4-4 to face Collingwood next Sunday while the Dockers travel to Adelaide to face the Crows on Saturday night.